The Purple Scarf: Beauty: New Night Love! Heya! When it comes to night creams for my face, I haven't really stuck to one brand. I use the GWP's, the trial sized ones, or the creams on sale. I guess I just haven't found "the one" yet. Then 2 weeks ago that all changed. I started using one of my creams I got on sale, that I have never tried before, and it was like I was hit by cupid's arrow! 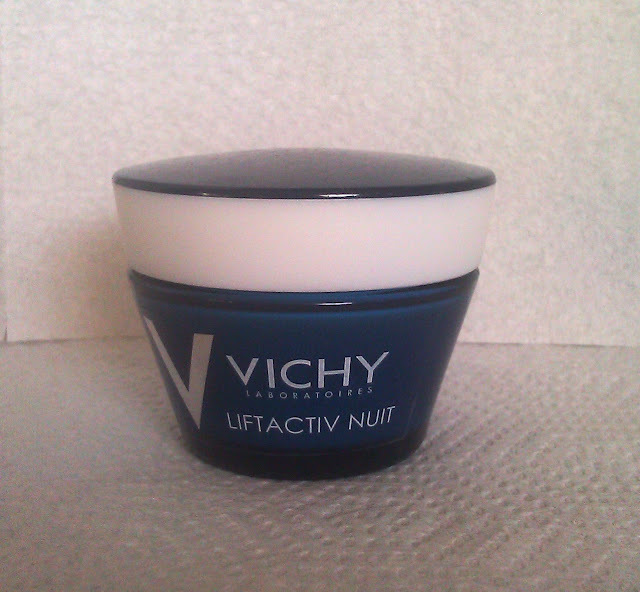 I love VICHY LiftActiv Night Cream! It's thick (which you want in a night cream) but absorbs into your skin quite well, so you don't leave half on your pillow! It's paraben-free and has a light fresh scent, which I like. And, I also love that a little goes a very long way, I use the tiniest amount for my whole face and neck. And after using this cream for 2 weeks, my skin feels amazingly soft and firm and the overall appearance looks more even. I think I will have to try the day cream next! Do you have any favourite beauty products you want me to try or review? Please let me know! And P.s! : I actually got this cream in a set so it came with a small day cream and serum! All for the price of the night cream, which was on sale!